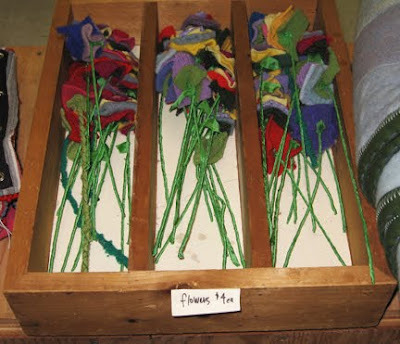 Last week I had the chance to attend the book launch party for The Sweater Chop Shop: Sewing One-of-a-Kind Creations from Recycled Sweaters by Crispina ffrench at her new community development project and artist studio, Alchemy Initiative, in Pittsfield, Massachusetts. Walking into Alchemy Initiative is surreal. Crispina, well-known designer and author, has turned this space into an amazing art studio, draped with twinkling lights from the ceiling; accented with vibrant paintings by Diane Firtell, Alchemy Initiative’s first artist tenant; and, of course, filled with sewing machines, ceiling-high piles of sweaters, an industrial-size dryer, and amazing creations made from all sorts of sweaters. 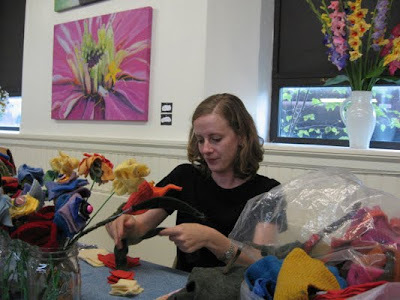 Along with Senior Publicist Michelle Blackley (above), I was swept into an arts-and-crafts project of making fabric flowers. We were instantly directed to the craft table, where we had our own personal lesson on making flowers out of sweaters and antique buttons, from a Rhode Island School of Design (RISD) textiles intern who worked with Crispina this summer (learn how to make these vintage imitations of nature on page 152 of Crispina’s new book). Engrossed in my arts-and-crafts project, I hardly noticed all the guests that were quickly arriving to celebrate The Sweater Chop Shop. After our little works of art were complete, we took it all in. 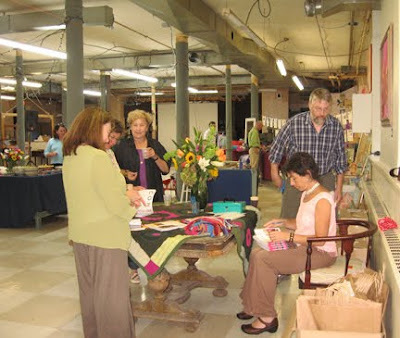 Newcomers were instantly pulled in by the charming sweater flower table, and it soon was crowded with eager crafters, snipping sweaters, sifting through buttons, and twisting their wire stems with an electric drill. 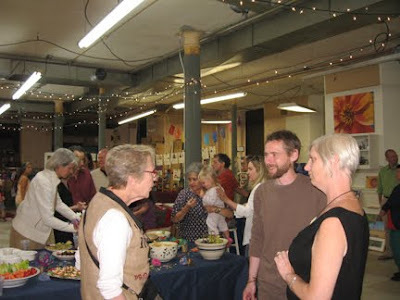 Munching on hors d’oeuvres while being serenaded by a guitar and vocal duo, Crispina’s fans marveled at her rugs, blankets, sweaters, ragamuffins, and even chairs! After guests bought their signed copies of The Sweater Chop Shop, they perused the 40 items that were made for the book, which were about to be auctioned off, trying to decide which ones they just couldn’t live without. Ladies were trying on pullovers and examining scarves right up until the last minute. Check out all the items that were auctioned at Crispina’s blog. The lively auctioneer described the items as they were modeled by Crispina’s RISD intern and an enthusiastic youngster. All the proceeds of the auction went to Alchemy Initiative. See what it’s all about here. The launch party inspired the creative side of me, and on my drive home I thought about what projects from The Sweater Chop Shop I could make for gifts (and for myself). 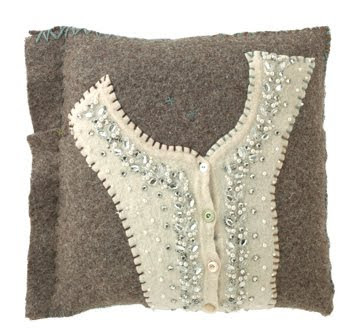 I think I’ll start with my favorite, the Button Placket Pillow (on page 54). I just love the offset appliquéd beaded sweater on the front! I’ll have to sort through my clothes and chop up the ones I don’t wear anymore, to re-create something even better. The book gives detailed instructions with illustrations, so I think I can handle it, even though I’m no designer. Crispina adds tips for ways to vary the projects to suit your own taste, too. Good luck crafting, and don’t throw away your sweaters! Crispina ffrench has been designing items made from recycled sweaters for over 20 years and has taught workshops, sold her products at hundreds of high-end boutiques, and been featured in in Country Living, Lucky, Country Home, House Beautiful, House & Garden, New York magazine, the New York Times, the Los Angeles Times, and more.